CardioComm Solutions, Inc. specializes in software engineering of information management systems and integration of bio-monitoring devices for the cardiac and telemedicine markets. The Company’s integrated electrocardiogram (ECG) and arrhythmia monitoring products and services enable quick and easy management of patient information and ECG recordings in a secure, reliable environment from anywhere in the world—specifically to record, view, analyze, and store patients’ ECGs for diagnosis and treatment of cardiac disorders. Rated as the best enabling technology for cardiac rhythm monitoring in 2012 by Frost & Sullivan, CardioComm Solutions’ technology is used in a number of software and hardware products dedicated to improving the quality of life for anyone who has been diagnosed with, or who may be at risk for, cardiovascular disease and specifically arrhythmias. The Company’s newest ECG recording device, the handheld HeartCheck™ PEN ECG, represents the first in-home, consumer-targeted health monitoring technology for over-the-counter (OTC) markets in the past 30 years. The HeartCheck™ devices (which also include a prescription HeartCheck™ Handheld ECG Monitor) are supported by software programs and patent-pending “SMART Monitoring services,” which the Company has developed to enable 24/7 patient monitoring and objective medical interpretation, with the capacity for integrating ECG reporting into existing electronic medical records (EMRs), among other innovative features. 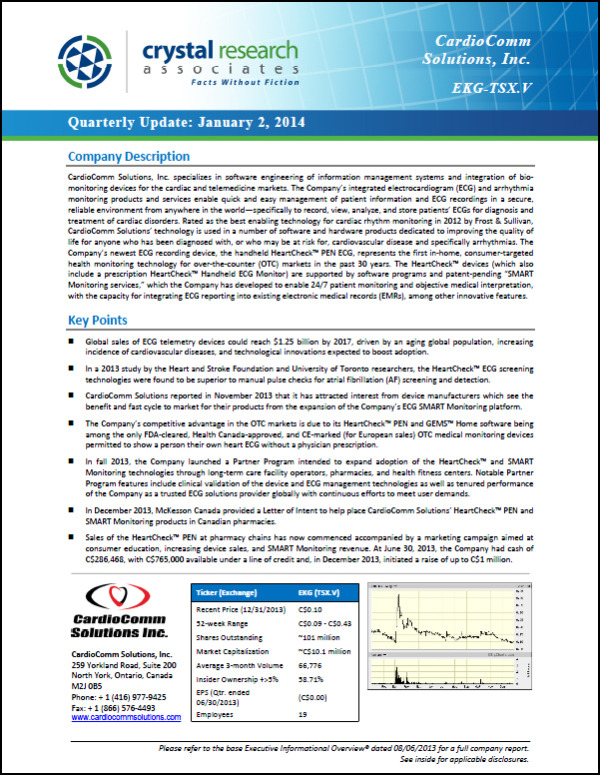 * The Corporate Snapshot was last updated on January 2, 2014.